Back in 2013, only a few weeks after Alan McDonogh and myself had successfully completed the landmark 1,400km London Edinburgh London (LEL) 2013 Audax on ElliptiGO bikes, Alan and I had separately heard about the Mille Cymru Audax – the toughest long distance cycling event in the UK, last held in 2010 and due to take place again in 2014. The Mille Cymru Audax is about 620-miles long, with an incredible 53,000 feet of total climbing and a tight time-limit of just 75 hours (within which riders must complete the entire course). (L-R) Idai, Alan & Stu at the start of Mille Cymru 2014: Upton Magna, 27 June 2014, 10:55am. Like many endurance athletes, Alan and I seem to have a persistent need to test our limits. We never even discussed it between us – and yet we had both known in our minds that we wanted to face the challenge. As with the LEL 2013 Audax in the previous year – at that initial stage neither of us could figure out how to make such a challenge appear to be realistically possible on ElliptiGOs – but the seed had been sown. I still don’t really know why I do this, but I think it partly relates to my belief that only by testing our limits can we truly know ourselves. I feel there are certain things you can never know for sure about yourself unless you are genuinely tested. You can ‘think’ you know yourself – but you cannot be sure – unless you are actually tested. In my youth I did this through long-distance running and later through kickboxing. But when our children were born I had realised that my wife was not comfortable with my continued competing in kickboxing. When I came across the new ElliptiGO bike in 2010 I saw it as an opportunity to challenge myself in what appeared to be a much safer way than kickboxing – and everyone at home was okay with it. However, it has since escalated to the same extremes as my previous sporting activities. I suspect my main objective when I had committed with Alan to doing the Mille Cymru ‘project’ was to divert a pending mid-life crisis. I turned 40 this year and, in my mind, getting into the best shape of my entire life would be a great way to celebrate this milestone. And what better way is there to push oneself to one’s limits than signing up to the most difficult, most seemingly impossible-looking cycling challenge available? My plan was to take my physical training to a level never before approached – and that’s pretty much what I was able to do this year. Cleaning up the bike after my final training session before the Mille Cymru Audax. During a 140-mile ride to Birmingham and back. As you can see the projection was, at best, a finish with little or no time left to spare within the time limits. The two lines highlighted in red (above) had become my areas of focus because those were the only variables which I believed could be manipulated if we were to bring a 75 hour finishing time within our grasp. But this analysis was good enough for both of us to make a commitment to working towards the challenge ride and seeing how we could improve on these figures. It was immediately clear with this synopsis – and based on our previous long-distance ElliptiGO performances – that the only ways to step up to a challenge of this level would be to either become faster (probably unlikely), to train harder and become stronger (slightly more realistic to aim for – but still a challenge), or to find ways of riding for longer – with fewer and shorter stops (which I thought was probably the most likely strategy to succeed). Alan and I had agreed from the start that we’d each need to search for our own ways of tacking these challenges in the Mille Cymru ride (a team ride like our LEL 2013 effort would simply not work for an event this tough). When the Mille Cymru event was opened for registration on 1 March 2014, Alan and I had signed up immediately and then gone about the business of preparation. 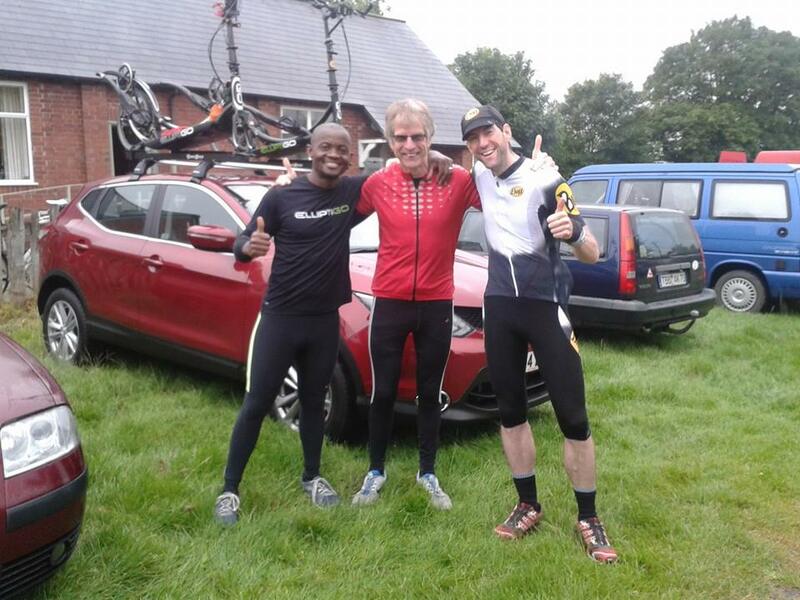 Our ultra-riding teammate Stuart Blofeld had also expressed an interest in the event after our registration and was able to register later (after some of the original registrants had dropped out of the event) and the three of us had then teamed up to plan to tackle the event. 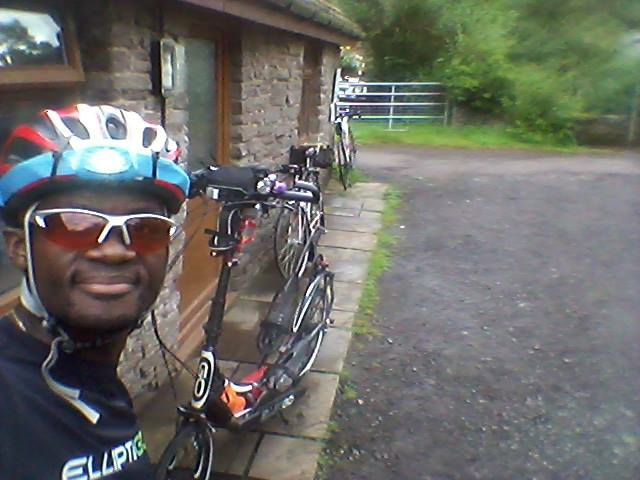 The end of the Chiltern 100 training ride (LR – Idai, Alan, Carl and Stu). We held two main planning meetings between March and June and we also exchanged numerous emails to discuss the possible event tactics and to share preparation ideas. Analysing all the possible ride plans I was convinced that stopping less often would be my only hope for finishing such a challenge – especially because I am a slow hill climber. It was obvious Stuart’s hopes would lie in his very fast pace and it had looked like Alan was somewhere in between Stuart and myself in what he could realistically expect to do on the course. How would I be able to stop less often – and for less time? In long rides you tend to spend most of the ‘stopped time’ doing just three things – eating, sleeping, or resting. By getting fitter and stronger the resting part can be minimised within reasonable limits, based on one’s genetic predispositions. But I was more interested in the other aspects that have nothing to do with what you were born with. Less sleep is seldom a good idea for any activity, and especially not for brutally hard exercise. Eating less often also seems like an immovable variable for an athlete. But as a long-time practitioner of intermittent fasting I actually saw this particular aspect as the big opportunity for manipulation in this scenario. If I could train myself to perform without the need to constantly eat, I could still ride at my normal pace – but by cutting out or reducing meal stops I could expect to meet the pacing requirements for an event that was 40% tougher than the LEL 2013 Audax. I had first begun to study intermittent fasting back in the late 1990s because I used to become nauseous during very hard training so I had felt that the only way to enjoy my physical training more would be to learn to do it without the need to eat before or during exercise. I had extended this philosophy to my endurance and martial arts training, but not for very long ElliptiGO training sessions (the longest ones being about 3 hours on runs, or recovery ElliptiGO rides, and 90-minutes at the start of harder and longer ElliptiGO rides – before making the transition to traditional sports nutritional practices for sessions which were longer than 3 hours, or of very high intensity). Many endurance athletes do the same thing – mainly to enhance their fat burning. What I hadn’t realised before 2013 was that I could also use this practice to enhance my carbohydrate loading for endurance performance, with just a few small changes to how I trained. And that aspect could potentially change the significance of this practice, with regard to my endurance training and performance. As soon as we had set our sights on the Mille Cymru event I had started working on my fasting plans for riding – and started testing my conditioning in the off-season between December 2013 and March 2014. I was surprised by how comfortable it was to do this type of training over the longer distances. So I had started to escalate the sessions in duration and intensity. By March 2014, when I’d turned 40, I had confidently done the hardest training session of my entire life – 40 hill repeats on the local hill climb at Bow Brickhill (which was 800m long, with a 12% average gradient) whilst fasting before and throughout the full session. 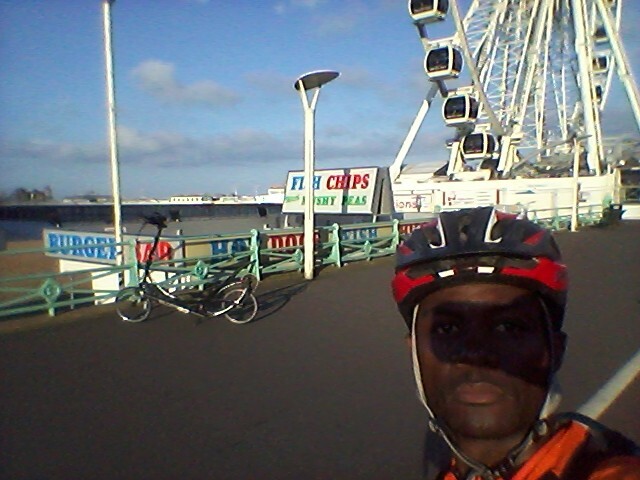 During a 240-mile training ride to Brighton. Although such a tough session was almost unbearable – mentally and physically – I had got through almost 6 hours of non-stop hill repeats feeling much better than I could ever have expected and I then knew that no long training ride could be as hard as doing 40 hill repeats. So it had become obvious to me that I should be able to ride very long distances without constantly eating as I went along. This finding really gave me the hope that I could aim to tackle the Mille Cymru Audax challenge without needing to become significatly faster – by simply minimising my stops. I’d built up my fasting conditioning from January through to March and after registration for the Mille Cymru Audax was confirmed I had started a series of training rides of 100-miles or longer, planned for every weekend leading up to the Mille Cymru challenge (I had eventually done 17 consecutive weekends of these 100-mile plus rides). It was the most engaging training campaign I had been involved in, because every week I was doing something new. I was also learning many new things about endurance and fitness training and I like doing that sort of thing. I especially enjoyed the long rides, because I had used different routes for almost every long ride I did in this training campaign. I hadn’t realised what a big difference doing this varied routing would make. Instead of my usual practice of using similar routes over and over again, to measure my progress, all I had focussed on this year was my training duration and intensity – using fun and interesting routes all the way through. 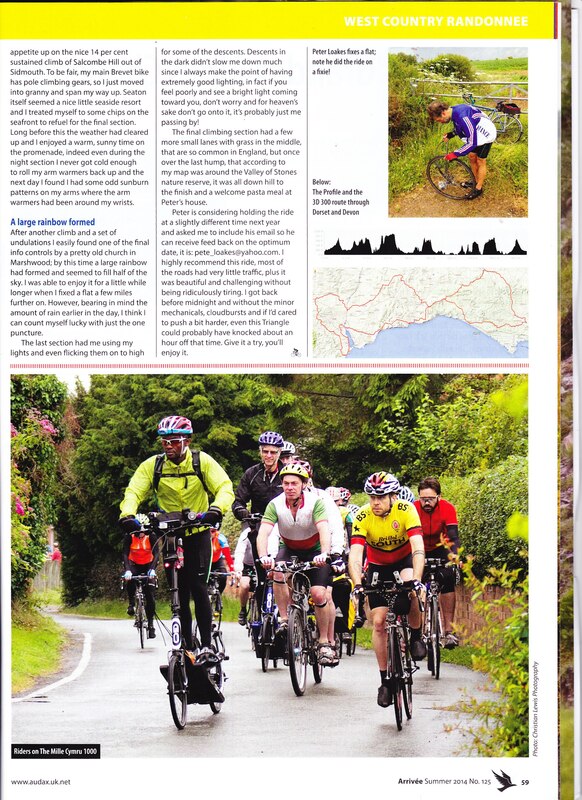 A photo from the Mille Cymru Ride (from the Audax Arrivee Magazine). My other big change was to use a heart rate monitor to control my work-rate in the early training build-up. It required discipline, but had progressed my fitness at a faster rate than ever before, being more concise and scientific for measuring true effort. I believe heart rate monitors are ideal for scientific base-building high-mileage training, but I still do not believe they have a significant role in actual long-distance endurance cycling events. I believe perceived effort is always a better indicator of your effort sustainability in a very long event. Riding while fasting had gone much better than I had expected as my mileage had increased. I had found myself actually able to ride better, with less ups and downs in energy levels during my long rides. I became more consistent in my performances and I was also finding that I recovered faster after training when I had started training in this way. It seemed to defy logic at times, but upon deeper scrutiny and closer study of the metabolic processes involved, it had become clear that it was a practical solution for training sessions of all intensities – a finding I had not expected. I’d initially thought fasting while riding would only suit my lower intensity efforts, but with full conditioning it had improved all my performances over all intensities and durations. So I had taken my fasting rides from 100-miles long to 125-miles long, and then to 140-miles long; and eventually up to 24 hours (about 240-miles long). The fitness benefits of those longer fasting rides had filtered down to my shorter distance performances, because of the tremendous carbohydrate loading impact they provided, but I believe only longer and harder workouts truly allow me to derive advantages over conventional sports nutritional approaches using this training approach and its effects are not particularly noticeable if your training sessions don’t last well over 3 hours (my rides had ranged from 8 hours to 13 hours, typically, in this training campaign). The biggest precaution with training while fasting is to maintain the correct electrolyte balance because drinking lots of water, while sweating for many hours, can pose health risks if you don’t pay attention to your electrolyte balance. So I used salt tablets to maintain my electrolyte balance during all my long rides. I have ridden as much as 13 hours on water alone (without taking any salt tablets) but this is not recommended and I only did so on occasions where my tablets had run out. For sessions under 4 hours long I still don’t bother with salt tablets when I ride whilst fasting. So how did the Mille Cymru challenge unfold after all this preparation? Alan, Stuart and myself had lined up to start the Mille Cymru event on 27 June 2014 in peak physical condition. We had all agreed there was no margin for error and perfect execution of our plans would be a must, if we were to succeed. The plan was to ride for between 20 hours and 24 hours at a time, before stopping for a huge recovery meal and a 3 hour sleep break. If I could do that steadily I would be able to maintain my pace through the event. But before starting I had no idea what my pace would be on that course because there was simply no way to know how I would perform on a course which was so rugged with hills. I had expected about 10 mph in moving pace and that’s pretty much what I had produced on the first day. We had started out quite subdued on the day and the three of us on ElliptiGOs had separated within just a few minutes from the start – although we had remained in each other’s view for the first 4 hours of riding. There were severe weather warnings in place and that had played on everyone’s minds in this first section of the ride. Some big storms raged that Friday morning and afternoon but the riders in this event didn’t take the brunt of them. A number of riders had early mechanical or health problems – almost from the outset – and those were the guys surrounding me nearer the back of the field. I was thoroughly impressed with how relaxed they had all appeared to be despite those setbacks. Control Checkpoint 1 – Knighton at 61km. I had reached the first checkpoint at around 38-miles and I saw Stuart just leaving the checkpoint. Alan was still there with his wife Kim handing him food and topping up his water. We’d exchanged greetings before he had set off again, close behind Stu. Little did I know that I would not catch another glimpse of Alan and Kim until I had reached St Davids – a day later – and I wouldn’t see Stuart again until the very end. The volunteers would tell me at some of the checkpoints that Alan and Stu had left not too long before my arrival, but in such hilly terrain it was impossible to see anyone more than a few hundred yards ahead of me. On the first day I had averaged about 10 mph while moving – and 9.5 mph overall, including the stops. This pacing demonstrated just how little I was stopping. Stuart and Alan were actually pacing similarly to myself, overall, but their moving speed was higher (meaning they were building more of a sleep cushion to allow them opportunities to stop for short rests). I was not stopping at all, except for the mandatories at checkpoints. My ride had gone smoothly, albeit slowly, throughout the first day. But progress was slow and the distances between checkpoints – often just 40-miles – had seemed enormous when riding on that hilly terrain. Every major hill climb which we reached would then become the biggest climb I had ever done, as they got progressively longer and steeper. I had never ridden on hills of that nature and every few hours I was unpleasantly surprised to discover that hills could get even steeper and even longer than the ones I had seen previously. My only saving grace was my 11-speed ElliptiGO, which has such a low first gear ratio that I could ease myself up the steepest of the hills without breaking my sustainable work-rate threshold. It was extremely slow going using that lowest gear, but it was a better trade-off than risking burn-out. And this gear ratio aspect is what I believe summed up this event for me. The use of my extra-low first gear ratio on the hills gave me the confidence that I could go up anything and would not fade – but this gear ratio is so low that the speed it produces is very low. The difference in pace between the lowest 3 gears is hardly discernible on the ElliptiGO 11R, but over days of riding it still adds up. Some of the climbs we did took nearly an hour to complete in the lowest gear – and if I had gone up one gear that may have shaved off 5 minutes. Not a lot for one hill, but over hundreds of hills and many, many, hours, it starts to mean something. Control Checkpoint 2 at Llanthony. 115 km covered. My advantage was that I did not feel the need to stop on any of the hills – or to consider walking up them. My boring hill repeat training sessions over the past 6 months had definitely paid off and I was able to hit the successive hill climbs without fading. At this early point my fasting ride strategy had also paid off, because my pace did not allow for any meal stops if I was to still be in with a chance of meeting the time limit (and I was tracking just within the time limit for the first day). By 10pm on the first day I had felt like I had one spare hour in the ‘bank’ for sleep. I really needed at least 3 hours for the sleep to be effective – and also because if I was to eat just once each day I would require at least 3 hours between my meal and starting to ride again whilst fasting (any less and you are not yet fasting and will be unable to continue to ride without eating full meals, at regular intervals). The big turning point for me was when something went wrong on the first night between the Tintern and Llanwrtyd Wells controls. We were directed on the route to turn onto the A40 dual carriageway and as I had followed that instruction the map had suddenly changed track – and although I could see the road that it had wanted me to use I could not get from the dual carriageway onto that road. I still have no idea why this had happened. But I had tried a few different approaches, by changing the resolution on the satellite map, which unfortunately could not get me back onto the route. This ride was the first time I had used a cycling GPS device and it had worked perfectly until that point. Had I more experience I would immediately have traced the route on the GPS map to see if it would merge back to the road I was on – which it did about 10-miles away – but at the time I hadn’t seen that. So I had first tried a variety of alternative routes before eventually working that out. 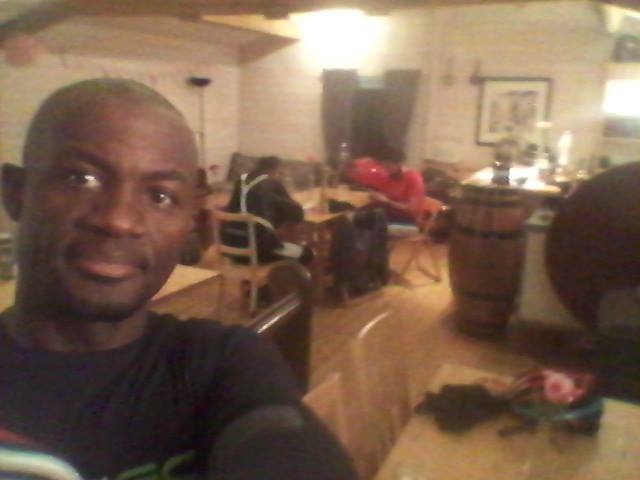 In the Pub at control checkpoint 3, Tinter (165km). This had lost me over an hour and had gained me a needless 10-miles of extra riding, which actually skewed my true average pace (according to the cut-offs). So each time my GPS had shown a specific distance I had to mentally calculate the required event pace, based on having ridden 10-miles less than were actually indicated on my device (meaning my event pace was slower than indicated on the device). It was becoming hard to tell how I was tracking against the time limit from that point. On that first night I was quite worried about not sleeping according to the original plan, but I felt I could hang on for a while. I would not be comfortable trying to sleep with less than 200-miles covered – or less than 24 hours ridden. In my view, those were realistic expectations and were also necessary goals to have if I wanted to complete an event of this nature within 75 hours. But having unnecessarily lost an hour within the first 12 hours of riding, my plan had already been disrupted. I knew in my mind that there was no margin for error, but looking at my pace it was evident that I could potentially recover this situation. If I could get to half way within 36 hours there would be a theoretical chance of completing the distance within the allocated 75 hours – with just one or two sleeps somewhere along the way. 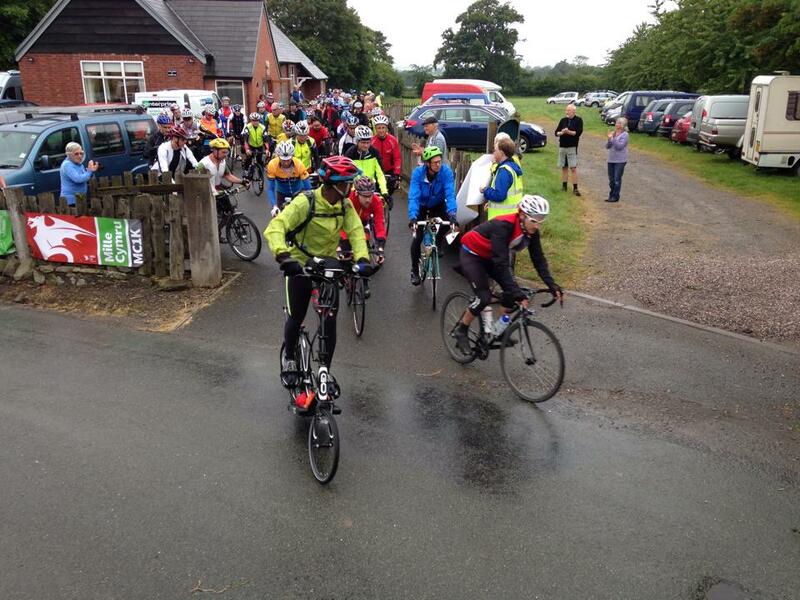 More big hills had followed on the Saturday morning (28th June 2014) – Day 2. Llanllwni Mountain was unexpectedly steep and I think will go down as the steepest hill climb I have ever ridden. I did ponder in my mind whether or not to stop and walk on that incredibly steep gradient – but I had decided that getting off the bike would ‘break the chain of psychological commitment’ and I had decided to try to ride all the climbs, regardless of the physical strain I might encounter as a result. At the end of Stage 1 Llanwrtyd Wells (270km covered). I discovered when I arrived at the next checkpoint and checked my phone messages that Stuart’s back wheel rim had broken on top of that massive Llanllwni Mountain – no doubt because of the cumulative heat and friction of trying to control the speed with his brakes as he was descending the slopes. It would have been a game changer – and it had made me think just how lucky we were to put some spare wheels in Kim’s car on the day before we had started the event! I had forgotten the spare wheels at home on Thursday afternoon but had called Stu whilst driving to his house to tell him I was turning back to retrieve them – even though it would delay our arrival to Wales by another hour. The second day of Mille Cymru was very hot and I was glad to get to evening time, when the temperatures had subsided a little, despite the daylight lingering until very late. In the later afternoon heat I had started to feel my lack of sleep. Having awoken at about 6:15am on Friday 27th June 2014, I had realised that if I was to reach the end of Stage 2 within the cut-off time of 6:18am I would need to have remained awake for a full 48 hours. I would also have gone without food for about the same amount of time. It was a daunting prospect, but I have always told myself that when up against a wall all you can work with are the options you have – and one has to face up to that. It’s better to attempt what seems impossible than to do nothing at all about it and to simply accept your fate. I don’t like to say anything is impossible – and as I had never attempted a feat of this nature I had decided that I would have to try it first, if I was to remain in the event. Looking back, it was certainly the wrong decision. Had I the time, I would have seen the sound advice a number of experienced long-distance cyclists had been giving me through my online media, telling me to allow myself time to sleep even if it would take me behind the time limits for a while. After the rejuvenation of sleep you can ride faster and are mentally sharper. I had seen this myself at the end of the first night and even during the first afternoon (when I would pass flagging cyclists, only to have them overtake me a few hours later looking like completely different people)! When I would ask where the ‘new energy’ came from they would say they had taken a short roadside nap. I should have done what I had initially said I would do before the event had started and allowed myself to fall a little behind the pace by taking a sleep break around 24 hours into the ride (knowing that I would potentially have a chance to recover the pace later in the event). But as the fatigue had set in I’d initially thought I would wait awhile and not rush to any decisions. Then I had decided to make a decision based on the fact that although feeling mentally tired I was still physically strong (despite not having eaten anything since breakfast at 7am on Friday 27 June 2014, the morning in which the event started). My new plan was then to recover my pacing by cutting out the Day 1 sleep break (and sleeping at the end of Day 2 – which should have been my second sleep break). Then I could resume with the original plan for the final day of riding. This plan sounds stretching – and it was! But clouded by sleep deprivation I was unable to reason properly – and I instinctively tend to be suspicious of anything that looks like an easy way out of a problem. Based on my physical strength I had thought I would be able to maintain mental clarity in the final 60-mile stretch all the way back to the Llanwrtyd Wells control, at the end of Stage 2. That would be over half way through the event (at 576km on the route map). The final stretch to the half-way control was a long one, at about 60-miles long, and would take all night to complete, even under the best of circumstances. I know that I am usually vulnerable to ‘body-clock issues’ around 3am in the morning on long rides and I was getting a little worried by the prospect of entering that ‘danger zone’ during a 48 hour stretch of riding – without sleep breaks – in the toughest event I had ever entered. But at the time I believed I could do it, somehow. My strategy was to dose up on caffeine tablets around that time, to keep me alert, and that’s what I had done. It had seemed to be working well – and at 2am I was sure I could make it through the 60-mile stretch to the end of the second section. But around that time the drowsiness had descended on me suddenly, within a period of just a few minutes – quite literally. It was like hitting a wall. My field of vision had narrowed into a dark tunnel – lit only in the middle by my headlight. I had thought the light battery may have gone so I had actually pulled over to stop and change batteries. But things had remained the same! I had tried to fight it. But the nature of this sort of ‘melt-down’ is such that your mental function is virtually switched off – and I was unable to reason. It was a brutal ‘melt-down’ – sudden and severe in nature. I could not even figure out how to follow the route map, or where I was on the route, or which GPS track to load on my device in order to continue to the end of the next stage. I could not even read my brevet card (with the stamps from each control checkpoint) and I could not tell which direction to read it correctly! I was frustrated and realised at that point – stopped beside the road – that I was no longer able to navigate. My mental faculties were crumbling. 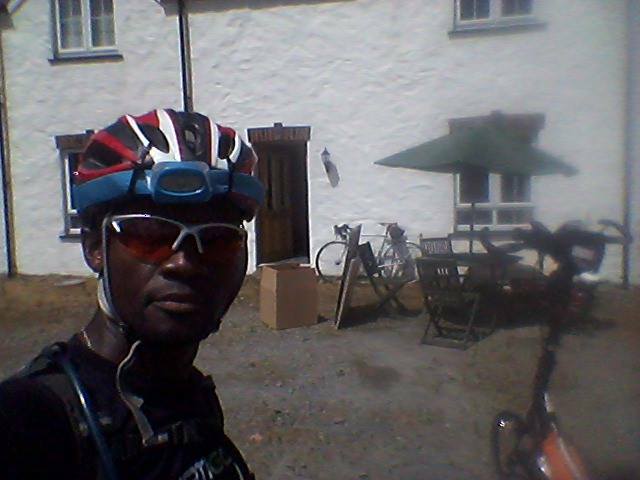 At Cilgerran, control checkpoint 5, at 360 km. I had stopped and fiddled around with a few items on the bike, which did revive me and allowed me to move on for about half an hour. I’d taken a double-dose of caffeine (400mg), which I was worried about – but I had felt I could handle it and was willing to try anything. But I had realised I still couldn’t keep going. I was still able to push up those enormous hills but on the way down I could not tell, in my limited tunnel vision field, which way the road would switch at the bottom of each hill. There were trees, cliffs and other hazards at the roadside which could pose fatal obstacles at the speeds of 30 mph and beyond that I was descending those hills at. I was also hallucinating and noticing brownish armadillos huddled at the roadside, seemingly poised to dash across my path of travel! I had actually laughed when I saw that – knowing they were hallucinations – but I also felt a surge of anxiety because the hallucinations had started and that normally marks the end of a stretch of riding. Luckily the villages I was passing through were strewn with bus shelters, so I had decided I would take an emergency power-nap in the next bus shelter I saw and then continue from there when slightly revived. Isn’t that what all the experienced long-distance cyclists do? Well, what I hadn’t expected when I had entered the next bus shelter was a swarm of bats to stream out all over me! They were not hallucinations – they were real. But that in itself didn’t particularly rattle me because at that level of fatigue I couldn’t care less. But when I had realised that the seat and floor of the bus shelter were covered in bat droppings I knew I could not sleep there. In my no longer functional brain I had taken it as a ‘sign’ that I would need to aim to ride the rest of the way to the end of that stage, before sleeping. After I had ridden off from that soiled bus shelter I had realised that I kept finding myself riding on the wrong side of the road every few minutes – without knowing how I got there… It had felt like I was blinking – but obviously the ‘blinks’ were taking long enough for me to drift across the road. There was not a single part of the course without hills – either we were climbing or descending. The descending was usually pretty fast and most of the hills were at least 10% in gradient. My field of vision was narrowing into a tunnel and I could barely see the roadside trees flying past in the dark. I knew that if I had made a mistake at this point and hit a tree at 30 mph it could be fatal. I’d stopped again to question myself and to try to clear my mind. Was I at the end of my road? Or was I just quitting? Stopping had felt like the easy thing to do at that point. So, instinctively, I had felt it was the wrong choice. I had tried to go again and rode on for about 10 minutes. Again, the tidal wave of sleep had overcome me – and this time I had noticed, when I got off the bike, that I could not balance properly when I was standing. I was staggering a little, as if I was drunk. But I still had the strength to ride up 15% inclines and I could still balance okay when on the bike. I simply couldn’t stand properly when off the bike! I had promised myself I would try one last time – and if it had happened again that would be the end for me. I prayed to God – as I always do – for strength and for guidance. Control checkpoint 6: St David’s – smallest city in UK – at 414 km into the route. I got back on the bike, rode out of the darkness of the village just before Carmarthen and into the bright lights of the A40 dual carriageway. I then thought I might just make it after all – I felt optimistic again – but within two or three minutes the ‘darkness’ fell over me again (this time with the bright street lights shining all around me). Carmarthen was busy with night-clubbers. A bunch of girls holding their high heels in their hands and walking barefoot – completely drunk – had approached me with their equally drunk boyfriends, and for a few minutes we had chatted about what I was doing, posed for some photos, and I’d asked everyone about a few possible spots where I might find a bed to lie on for a short time to revive my flagging senses. I thought I was down – but not yet out. If I couldn’t sleep in a bus shelter then I’d use valuable family funds and pay for a hotel to take a 60-90 minute nap! I thought, at the time, that it was funny how drunk people think everything is completely normal. 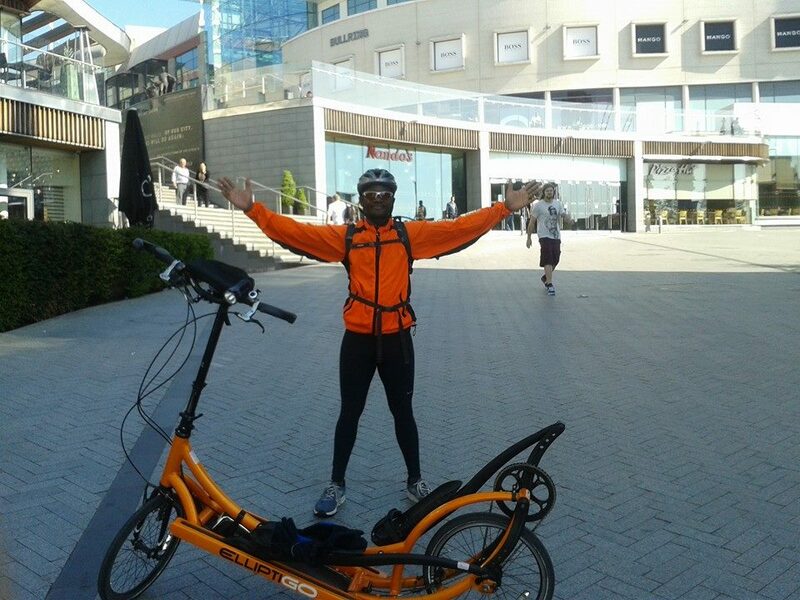 Most of them seemed to look at an ElliptiGO as just another bike – without the usual questions and excitement I tend to get when I meet people for the first time who’ve not seen an ElliptiGO. And this bunch had all nodded with great interest as I had explained my plight and they had all accepted that it was quite normal to ride 600-miles (through day and night) and that it was quite reasonable to want to catch a nap somewhere along the way and then continue again. The only ‘slight issue’ one of the girls had picked up on was that she couldn’t see the saddle on my bike and she had wanted someone to point it out for her! After chatting with another group of young chaps who were buying kebabs on their way home after a night of clubbing I’d felt the effects of the double caffeine dose keeping me awake. I was almost like a zombie. Not dead – but not really alive. I still couldn’t balance properly at that stage. I couldn’t think clearly, but I was not yet asleep. I had told myself had needed ‘a sign’ in order to make my next move. Should I ride away again? Should I take an expensive nap in a hotel – and then ride away? Or should I just submit to my physical decline and draw a line under everything? I did not think I could agree to quitting, even on my own terms. The truth is I don’t believe in quitting. “You must finish what you start” – I always tell my children that. But I had also promised my wife I would never endanger my life knowingly and that they should always trust me to make the right decision when faced with potential danger during an endurance event. Heading into this event Ivy and our children still weren’t sure I would be able to overcome the urge to risk pushing on dangerously during the tough stages – but in life you have to give people a chance – and that’s what I was given. The chance to prove myself, but perhaps not in the ways I had expected. Being a father and husband is like being in a team – because you are answerable to other people. In martial arts you get knocked out. That’s a clean way of ending things – and that’s easier for me to understand. Standing around in a busy street and looking around at fancy hotels during a long-distance cycling event feels like the easy way out to me. The lines between quitting and failure are somehow more blurred in an event of this nature. Cycling’s actually more like real life than martial arts is – because it is not black or white – cycling is ‘grey’. I saw all the kebabs some of the guys around me were holding. I don’t usually eat that stuff, but it had looked very good at this point. I saw boxes of fried chicken in people’s hands. I saw inviting free-houses and B & B’s on various streets. I could hardly balance or ride on my bike. I hadn’t eaten in two days of riding. I had some cash in my wallet. Why not just accept it was over and treat myself to some fast food? So I went up to one of the B & B’s and buzzed at the door. A man came out in a white t-shirt – as they do – and he told me there was no room at the inn. I looked up and thanked God – was this the sign that I should continue, that it was okay to continue to try? Then, just as I had turned to leave, the man at the door had told me to ride to the next road and turn left – saying there was a big hotel there with a night porter. I did as I was instructed and then I finally saw my ‘sign’. At Control Checkpoint 8: Amroth. 478km of the route covered. Then I had suddenly realised Ivy was probably going to hurt more about this than I would. My family and friends would feel it more than I did. In a way that told me I’d probably done the right thing. I think I’d failed. I don’t think I’d quit. There was still what I’d describe as “a deep darkness” about accepting this outcome. Almost like a bereavement. I had not finished what I had started. But I felt like I had no choice, I had played my part. Later that same morning I was up again, after a 3-hour nap in the hotel. The double-dose caffeine had kicked in strongly and I could not stay asleep despite nearly two days awake – riding. I had to find out how Alan and Stu were coping so I got on the phone. I soon discovered Alan had called it off that morning as well – after passing the control checkpoint at Llanwrtyd Wells, which I was also trying to reach overnight when I had stopped. He was also tracking just within the time limit, in relation to the cut-offs, but with no sleep cushion – and had met the same problems that I had with sleep deprivation, despite his obvious physical strength. 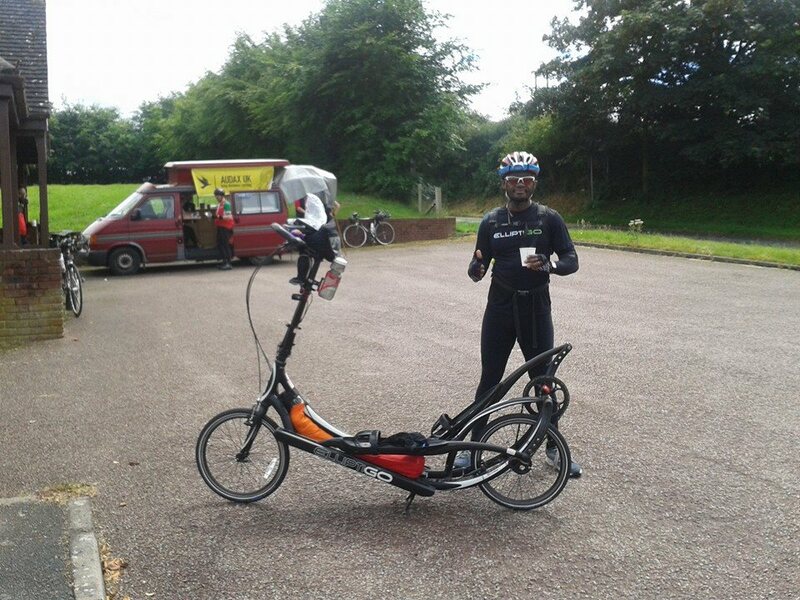 Stuart had built a narrow sleep cushion at the right rate throughout the event and had managed daily naps, so that his overall average pace was not tremendously faster than ours – but his actual moving pace was – and that’s where the difference was in this ride. My moving and overall pace were always within 1mph of each other, from the time I had started to when I had finished. Ironically, that had meant that I had achieved my goal of not stopping – but at the expense of not sleeping, unfortunately. It appears the same thing had happened to Alan. 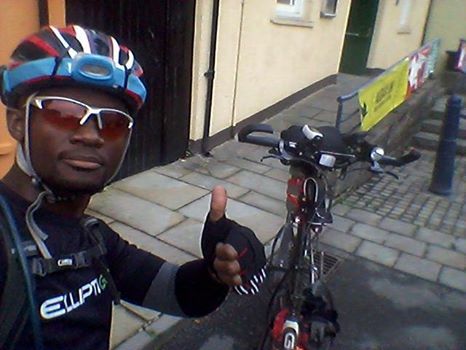 Stuart Blofeld eventually completed the Mille Cymru Audax ride in a brutal 73.5 hours. It was a pioneering achievement in endurance sports and in long-distance cycling. It is an achievement he can now carry with him with pride – for the rest of his life. He has earned the respect of his peers. He has learned new things about himself. And that is why we do these things. That is the reward of doing so. There is a purity in pushing oneself to one’s true limits. I was exceptionally proud of Alan and Stu’s performances – and how they had conducted themselves in this brutal challenge. 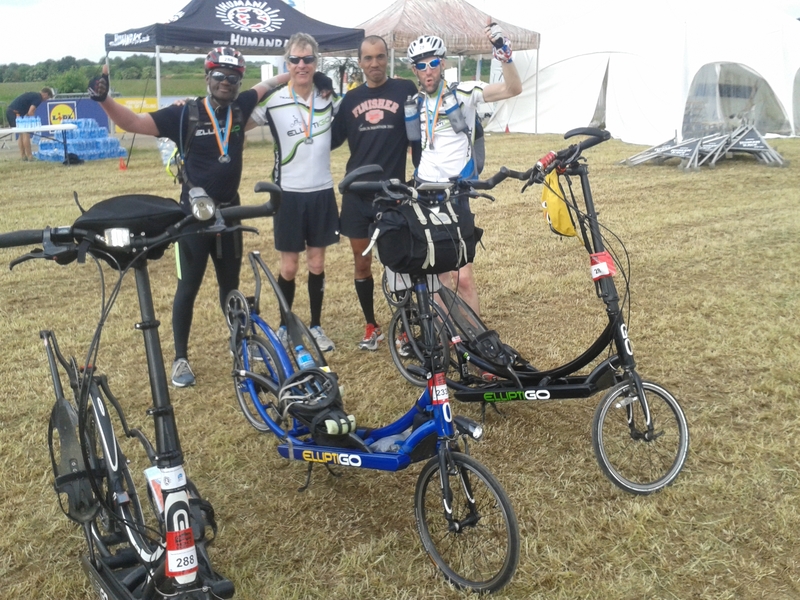 We’ve all been on this ‘ElliptiGO journey’ together – almost from the very beginning – and I truly don’t think I’d be where I am in endurance sport if it wasn’t for these guys. I still believe nothing is impossible. I knew at least one of us would get through the Mille Cymru Audax successfully. I truly had thought we all would make it – but in life the ending is not always perfect and is not always the one we wanted. 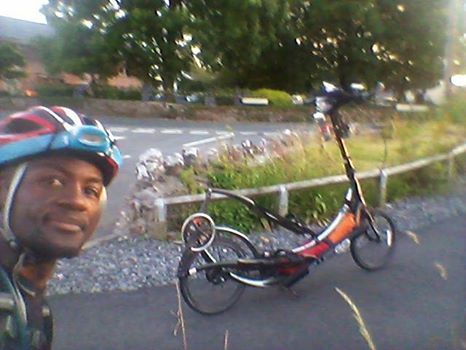 To summarise: during the Mille Cymru Audax I had ridden the ElliptiGO for a total of 336-miles and it had taken me 39 hours to cover that distance. This represented 326-miles of the course, due to detours which had cost me an additional 10-miles of riding. My moving average pace was 9.5 mph. I had fasted throughout the ride – and for 3 hours before the ride – making it a 42 hour fast, the longest period of fasting I had ever done. I was satisfied with my riding performance but had felt that I had let myself down with my execution strategy for the ride. It was a great learning experience and I had no doubt it would make me a better long-distance cyclist in the future. 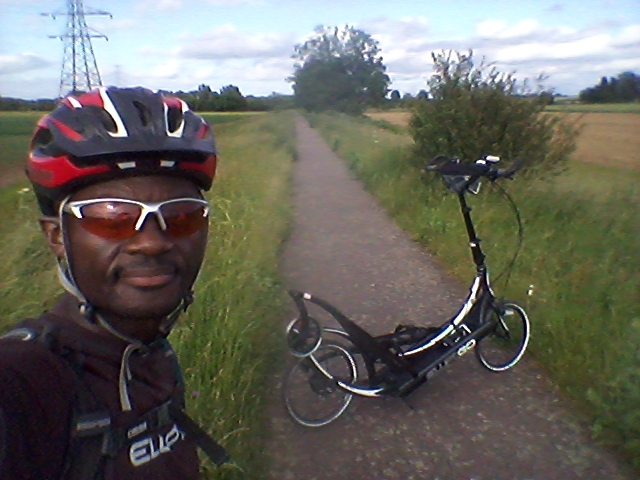 There’ll almost definitely be other long-distance endurance cycling events for me in the future and I want to aim to enjoy my ElliptiGO riding more. I don’t think I’ll ever be able to motivate myself to get into quite the sort of shape I was in this year because it takes a lot of sacrifice and now that I’ve done it once my ‘mid-life crisis’ appears to have been averted for the time-being. I like to be extremely fit – but even for me this year’s campaign has been extreme. If I had the choice again – yes, I’d do it all over again. But now that I have actually done it I don’t really feel the need to do it again. There are too many personal sacrifices involved in reaching this level of conditioning and I have to drag everyone that’s close to me along with me. Hard training can affect everyone involved in your life – it’s not just about the athlete who’s training. So next year, God-willing, it will be more about enjoying longer rides and enjoying my cycling and fitness training in general – no hill repeats, no mandatory high intensity sessions – just the stuff I really enjoy doing. I will continue to analyse what has just happened and to try my best to learn from it all. I had a long talk with Ivy on the day after ending my Mille Cymru attempt and we had talked about what I had felt and what I had thought I was learning from the outcome of this mission. The period after a huge endurance event often tends to leave a void in one’s soul – regardless of the outcome. Many athletes have told me this. Many of us are not sure how to address these post-event feelings. Just beyond Llanllwni Mountain… Day 2. 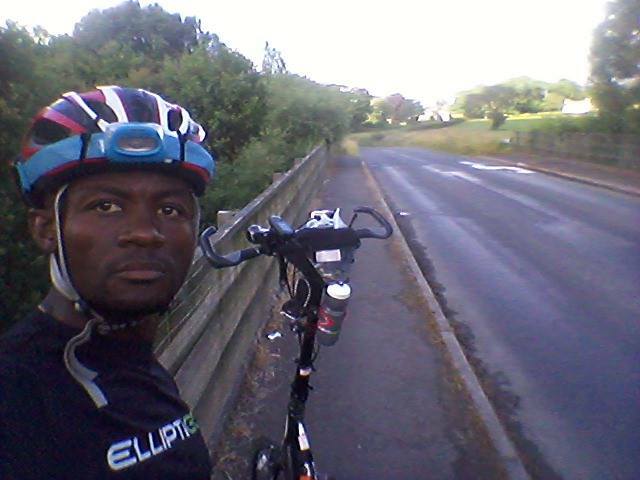 Last year there was an emptiness which came over me after the LEL 2013 challenge. I was in ‘no-man’s land’ for many months after the event was over. At the time I was not sure how to negotiate through that. But the light from deep in your soul eventually starts to shine again – as you take stock of the things you have learned from the experience – and new goals once again become a possibility. This time around I hope to deal with it better and to find ways of remaining positively engaged – by doing other things with my life – until that urge to be tested starts to return. Alan has a marathon to train for in Venice, to keep him engaged. 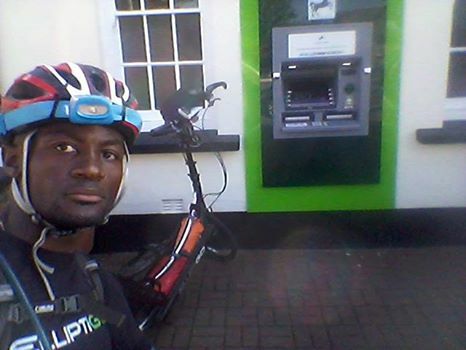 Stu is training to break the 100-mile ElliptiGO record. My cycling buddy Phil, who also entered the Mille Cymru Audax, is heading to the Dolomites for trekking and mountaineering. I now realise I should plan to make my schedule busier in future, after a major event, because that fills the emptiness and currently I have no plans for the bike. Always having something meaningful to aim for and train for is important for an athlete.